To finish off our month of staff recitals, George and friends presented a wide variety of tunes and instruments. George Linkert has been the Program Coordinator and “Game Keeper” at Sojourn for over 3 years. Weaving together stories and songs, George took Sojourners on a trip of his life through music! From traditional hymns and Shakespeare to the Beach Boys and Whitesnake, George shared how he got into music and how it influenced his life. We started with “Deep and Wide,” a song from his days in children’s choir at church. From there, we moved to 5th grade George and his first love: the trombone. That instrument would take him through college at Concordia Moorhead, all the way up to today! He met his wife, Janet, in a band, and picked up guitar as an easier way to woo her. He then taught band in public school for 8 years, and always wondered why kids didn’t want to practice—especially that king of instruments, the trombone! Now, George loves sharing his voice, trombone, and guitar with Sojourners. His love for music is infectious. A natural performer and entertainer, his antics and vivid storytelling brought lots of laughs and singing. Music, especially trombone, is how George likes to express himself and connect with others. Music is all about togetherness for George. “The joy of sharing love and experience makes [music] special,” he explains. 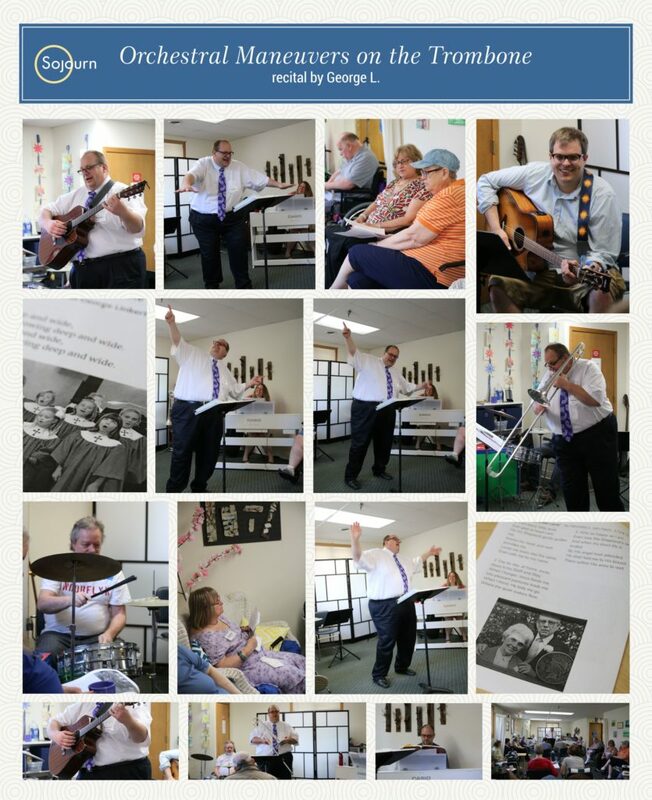 At a place like Sojourn, where it can be hard for people to connect, music is a link between all Sojourners, both clients and staff. As George put it, “Music changes anguish to triumph and success.” He is grateful to be a musician, helping people connect with themselves and with each other. We are so grateful for you, George! Thank you for bringing your music and your heart to Sojourn!